“In appearance she was thoroughly Saxon, with very fair hair, light blue eyes, and rather tall and well-developed figure, a pleasant though not beautiful face, and an expression of mingled kindness, intelligence, and decision. She was born to rule, and enjoyed doing so.” From E A Walker’s Sophia Cooke or Forty-two years’ work in Singapore, published by Elliot Stock, London, in 1899. By the mid 1860s the Society for Promoting Female Education in the East (SPFEE) no longer hid behind its petticoat camouflage of calling its recruits “agents” and began referring to them as missionaries – in direct opposition to the accepted norms of that era. 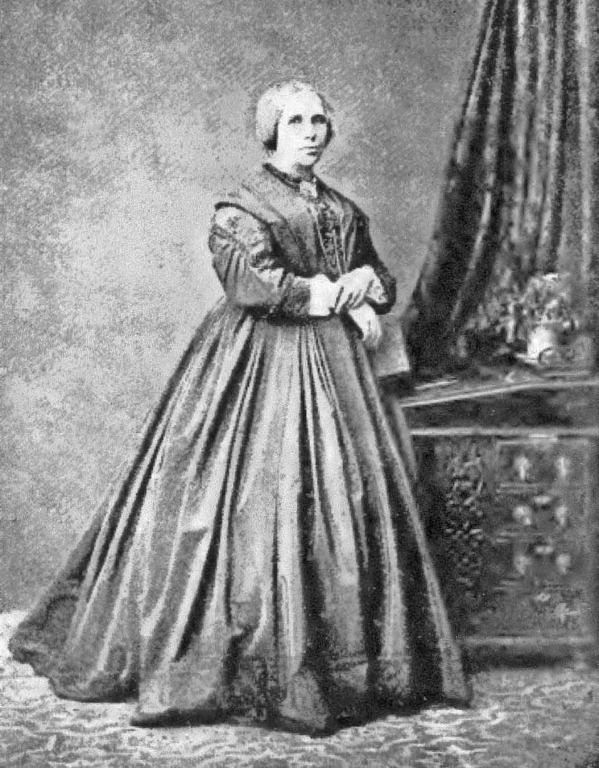 Sophia Cooke, as principal of the Chinese Girls’ School (now St Margaret’s, Singapore) became one of its best advocates in this challenge to what was a male-dominated career option even though there was increasing pressure on women to confine themselves to respectable domesticity. In England the concept of separate spheres for men and women was by then deeply embedded and well supported by some leading Evangelicals who used the Bible to insist that women were subordinate to men and their place was in the home. Among those who objected to this view was Catherine Booth, the “mother” of the Salvation Army. Like the Quakers of the 17th century she re-interpreted the Bible to show that it empowered women and even allowed them to preach. She began publishing her views on Female Teaching in 1859 and this culminated in her Female Ministry in 1870. By the late 1880s the Salvation Army did not make any distinction between men and women and their “lassies” could even be in charge of their Citadels. But many of those women were brutally attacked by angry mobs for usurping a man’s public role. The SPFEE took a less confrontational approach, tailoring its publicity so that it was acceptable to those whose financial support it so needed – either through direct donations or by producing the “fancy goods” which could be sold in places such as Singapore to raise funds for the schools. It did, however, create an effective “women’s agency” through its auxiliaries and work groups in Britain and Europe as it challenged the belief that only men, and ordained men at that, could be called by God to be missionaries. Miss Cooke’s visit to England in the early 1860s would, therefore, have been very important. She would have told many women’s groups that the girls at the Chinese Girls’ School (CGS) in Singapore were learning Scriptural truths, sewing and cooking as well as reading, writing and arithmetic to equip them to be the moral guardians of their homes when they married. And many of the CGS graduates were proving to be ideal wives for Christian converts, supporting them in their work as catechists and evangelists. But that was not all for Miss Cooke also reported that the school girls and graduates were directly involved in Christian mission. Leading the way was Hanio – a young widow by then – who was being supported by the society’s Dublin auxiliary as a “native missionary”. Hanio and her sister, Chunio, had first been inspired by Maria Dyer, the founder of the CGS, and then by Miss Grant, to break with their Chinese culture and become Christians. This was far from an easy choice. They, like other converts at the school, were not only taunted as being “Englishwomen” but also fiercely derided for having brought considerable disgrace on their families. In 1845 Miss Grant had obviously been very encouraged by these two sisters when they were at the school. She told the SPFEE then: “Chunio, my young happy Christian, to whom the Gospel is as wine, giving her a merry heart, brings me verses full of the joy of the Lord.” They helped her to create a Christian environment at the school where those who were converted were encouraged to become missionaries. In the next few years those secret societies turned on the Christian converts as they feared these would undermine their power by refusing to take their oaths of allegiance. In 1851 the Chinese secret societies in Singapore made a general attack on the Christian converts and killed about 500. It was not surprising that later Chunio and Hanio would choose to live in the growing Christian enclave around the CGS. In 1853 Miss Cooke took over from Miss Grant and attended the baptism of Chunio and Hanio’s younger sister Kay-chai. Working with young women like these she would turn the CGS into one of the most successful missionary ventures in Singapore in the 19th century. As the mission work of the school girls and the graduates developed Miss Cooke was very aware of the growing need of the 50,000 Chinese converts for a worship service in their own language. So in 1857 she obtained permission from the Anglican chaplain to convert a small bungalow beside the school into a church where services were led in the vernacular by Chinese catechists. To accomplish her other objective she returned from home leave in England in late 1864 with Miss Houston who soon started the first Chinese Ragged School. She would set up two – one based in the home of a graduate, while the other was managed entirely by girls living at the CGS. Among those CGS students were the five saved from a slave ship in the late 1850s. As those five reached out to the wild children on the streets Miss Cooke commented: “It’s beautiful to see what earnest little missionaries they are.” They had been raised as Christians by older girls at the school who were assigned to them as surrogate mothers. The graduates such as Anleang not only kept clean, tidy Christian homes for their husbands but also found time to evangelise among their neighbours, visit the poor and nurse the sick. In doing so they provided a voluntary welfare service even for those with leprosy. This service Miss Cooke later extended to sailors who were ill or destitute and, in 1882, helped found the Sailor’s Rest. The ragged schools were closed in 1884 as the CGS no longer had the funds to run them and the Singapore government had opened several schools. By then Miss Houston was dead, her health severely undermined by the trauma of being caught up in a riot in Fuzhou, China. Supported by Miss Ryan at the school Miss Cooke extended her mission work in Singapore. She began leading Bible reading groups in 1875 using notes written by the Revivalist Dwight L Moody. These groups would include those for sailors, soldiers and policemen and she introduced to these as well as to the school the hymns of Ira Sankey, Moody’s associate. The school choir became renowned for singing Sankey’s and other English hymns. Miss Cooke helped to organise branches of the Ladies’ Bible and Tract Society and of the British and Foreign Bible Society as well as founding the Singapore YWCA in 1876. The latter became a centre where the married CGS graduates could meet each month, share stories about their mission work and encourage each other. But for Miss Cooke God’s Call to her was to serve in Singapore and so she returned. In 1882 she reported that she was still regularly visiting the sick in hospital (at the General and the Military Hospital) and the CGS girls were helping her by making pillows and excellent bouquets of flowers. They also made bouquets and wreaths for the twice-yearly sales which helped to raise funds for the school. She died in September 1895 and Miss Ryan carried on her work at the school until the SPFEE sent Miss Gage-Brown to become its principal in 1897. E A Walker, Sophia Cooke or Forty-two years’ work in Singapore, Elliot Stock, London, 1899. Bobby E K Sng In His Good Time , Graduates Christian Fellowship,Singapore, 1980 Re Chinese Secret Societies – p 57.